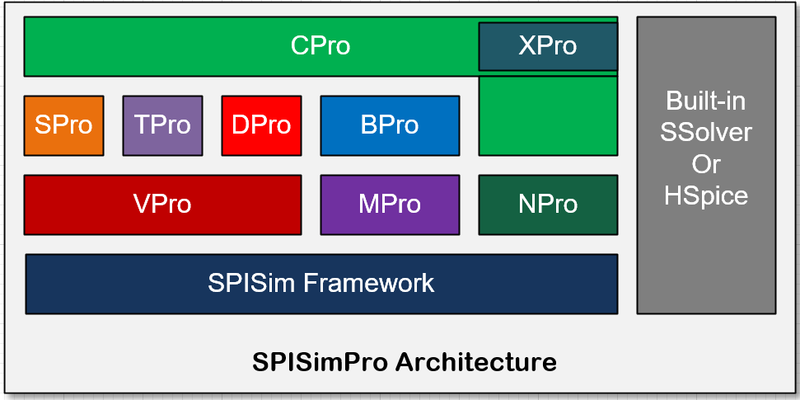 SPISim’s software framework is architected from ground up specifically to meet the design and analysis needs in signal integrity, power integrity, packaging, modeling and simulation areas. All our products are developed to be modualized, integratable with each other, switchable on the fly from top, cross platform, self patch-able and highly efficient. From post-layout net analysis, schematic creation for building channels or extracted nets, what-if simulation, powerful waveform viewer in TD/FD, performance evaluation for Tline, S-Parameters etc to the optimization using various algorithms and highly efficient simulator, we have got them all. User only needs to install one tool and all these capabilities will be available in the same single system. In addition, we carefully choose and integrate tried and trusted open source libraries to provide far more capable features beyond average engineering software. Be it genetic algorithm, neural network modeling, spectral analysis or S-parameter manipulations. They are seamlessly integrated in one framework without additional toolbox licenses (RF, control etc) or (Matlab) compiled runtime needed. Combined with our domain expertise in modeling and methodologies implemented in industry’s best known methods, our products are among top of the line in this industry in terms of qualities and capabilities yet at only fraction of cost comparing to our competitors. For lab environment, specific flow for your technician, or for your external customers, we can easily customize from existing features in a dedicated or much simplified GUI through add-ons without reinvesting your engineering resources. The video below demonstrate the flexibility of our software products. For best presentation quality, play HD version with full-screen mode.